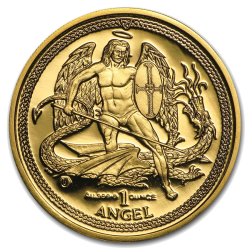 The Isle of Man Angel Gold Coin takes its name from the stylised image of the Archangel St. Michael that graces its reverse. Issued for the Government of the Isle of Man by the Pobjoy Mint, these highly popular gold coins made their debut in 1984 as a proof gold coin and from 1985 as a bullion coin. Isle of Man Angels were struck from 22 carat gold until 1993 and then minted in .9999 (24 carat) gold from 1994. Today, these beautiful gold coins are as attractive to investors as they are to collectors and we stock Isle of Man Gold Angels from various years. Manx Gold Angels are legal tender on the Isle of Man so all purchases are CGT Exempt and VAT Free in the UK. Find the Isle of Man Angels at coininvest.com for fast, secure delivery.